Africa is one of the most fascinating continents. It has amazing wildlife and unbelievable nature scenery. From high snow peaks of the Kilimanjaro, to the deserts of the Sahara and the Jungles of Kongo and the vast savannah of the Masai Mara. Africa has it all. Gorillas, cheetahs, rhinos, lions and elephants and thousands of other wildlife animals. If you are traveling to Africa, you are going for a superb trip. You should take a camera and lots of patience, as in Africa the time ticks in a different tempo – African Time. Most of the people who travel from Europe or from USA are concerned only about the medical aspects depending on the area you are planning to visit. But there is one more aspect worth your attention, if you are planning a safari trip to Africa. Make sure you are prepared for the direct sun threats which are more popular in Africa than in other places. The sun is the same sun everywhere, but Africa is located near the equator, which means the angle of the incoming rays from the sun and the UV radiation is 90º. In Europe and in USA the angle is softer due to the tilt of the planet. The sun rays in Africa around the equator are much more intense. If you have fair white skin you should take extra caution to avoid skin burns and long term UV effects. Medical research showed that it takes twice of severe skin burns to increase the chance for melanoma by 50%. Those with pale skin need to plan how they avoid getting sun burned when traveling in Africa. First of all you need a ‘broad spectrum’ lotion, which protect from UVA & UVB too. Regular SPF creams have been found not relevant by FDA because they do not filter the UVA rays which are harmful, but do not cause immediate damage. The number can be SPF 30-50, anything above 50 is a marketing trick and the added protection is nearly non existent. Take enough sunblock cream with you because the FDA recommends to apply every two hours in order to get the protection effect you expect. Apply a 1 teaspoon of lotion per body part: Leg, arm, face. Hat – You need a hat, with a wide rim. Prefer hats with a cover for the back of the neck for better coverage. The neck and shoulder skin gets easily burned and that can ruin your trip for a few days. Check here if you do not have a proper travel hat. UV Umbrella – You may see today more and more people using a ‘sunbrella’ for better protection from UV radiation. There are many types and kinds to choose from. You must make sure the one you pick has UPF 30-50 (the fabric’s UV protection level). Check here to get a UV protective Travel Umbrella. There are women UV umbrellas and unisex UV umbrellas. Their main advantage is that they cover the whole exposed upper body skin, face, neck and shoulders. Another advantage is that they give a cooling effect, due to the dark shade they offer, which is recommended in Africa..
UPF Safari Clothing – Going on African safari means being many hours outdoors. Covering the face is fine but UVA can penetrate most of the T shirts and cotton pants, which mean your 95% of your body skin is exposed to UVA when you are out on safari. You can choose which ind of UPF clothing you prefer, the upper layer or lower layer and which kind of apparel suits your travel style. 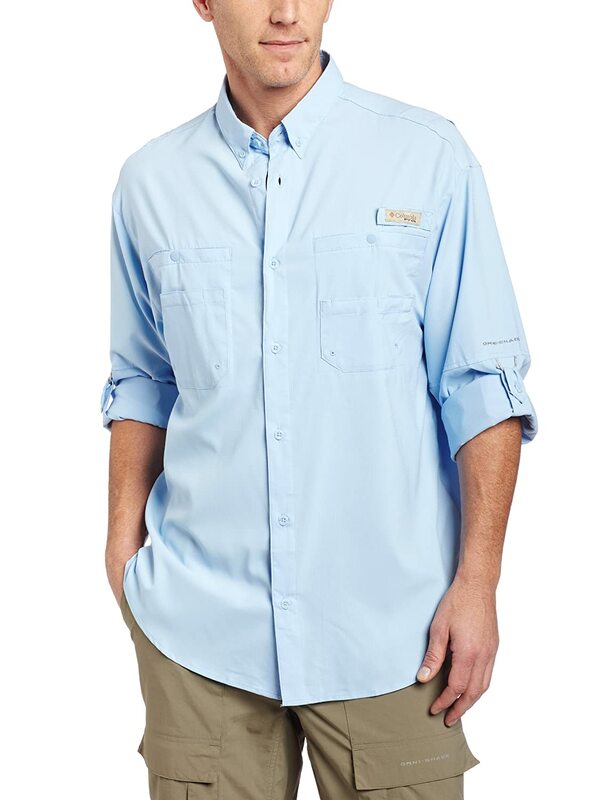 There are UPF T shirts which you can wear under your travel clothes or as light loose travel shirts.They are great for safari because they have ‘wick moisture management’ and ‘quick dry fabric’ both features are relevant for off track trips. Click here to get this type of UV blocking T shirts. Or you can get the khaki buttoned shirts which are more stylish, especially when going on a safari trip. They are also with high UPF protection level, which block or filter 95%-98% of the incoming UV radiation. There are endless designs, brands and styles, some with long sleeve and some with short sleeve. 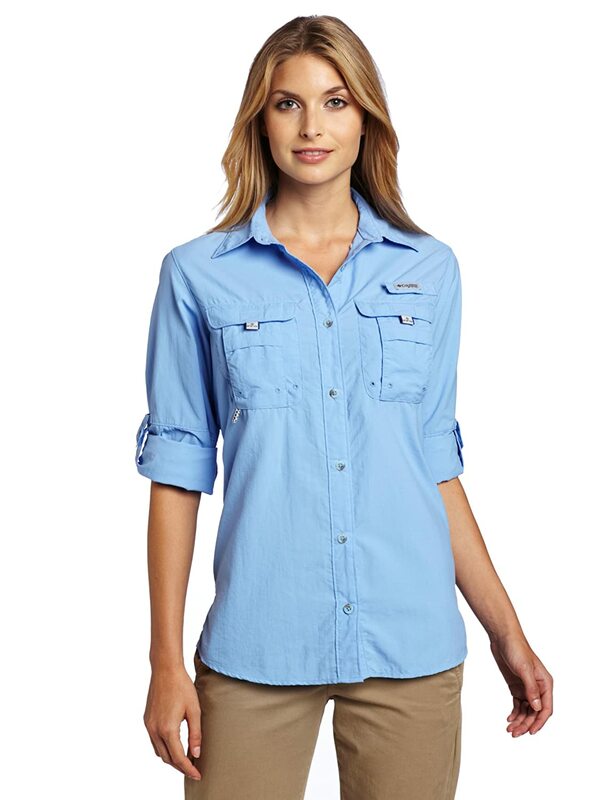 Like this Columbia Women’s Bahama Long Sleeve Shirt. You need also to keep the sun dangers when planning hikes and expeditions, plan to stay in the shade, or travel in the cooler hours and not at midday, when the sun ultraviolet radiation is at its peak level. This entry was posted in Sports UV Protection, UPF Clothing, UV Protective Accessories and tagged hiking clothes, sport UV clothes, UV Hiking Clothes, UV Traveling Clothes by UPF Clothing Admin. Bookmark the permalink. Next → Next post: Does Your Car Window Block UV Rays?